Set in the 22nd Century, Enterprise predates the enigmatic Kirk and his crew, but still leaves room for high tech CGI wizardry, creating space ships, aliens and backgrounds never seen before. Artists have already had to cope with space anomalies, morphing aliens and a temporal cold war - allowing for a future post-apocalyptic setting for the end of season one. 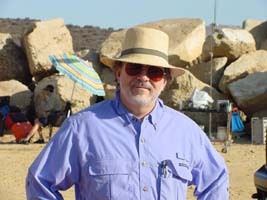 Working in-house the team is run by Dan Curry [pictured right], visual effects producer, who oversees the two separate CGI teams headed by visual effects supervisors Mitch Suskin and Ron Moore. The episodes are divided in two - one team taking on the 'odds' and the other the 'evens'. They then oversee the main CG work, which was created last year at Foundation Imaging and, from season two onwards, at Eden Effects. Other, mainly 2D effects, such as warp stars in the background, phaser fire and transporter graphics are created by Technicolor Creative Services. 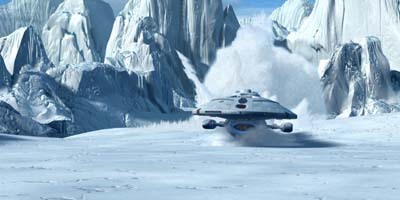 Over the many years of its existence, CGI has been the biggest step forward for Trek. "I have been involved in the production of visual effects for over 25 years, and for me CGI has been the most profound technical advance during this period," says Suskin. "It's hard to appreciate the significance of computer generated effects if you didn't work in the period before their development. It took weeks and sometimes months to complete shots. With the advent of computer graphic tools, a single artist can have complete technical and creative oversight on a shot, and can complete an effect in days or hours instead of weeks. This was never possible with model photography and optical compositing." It wasn't all plain sailing during the transition however, and some were reluctant to change. "At first I think it was harder for us as we used to prefer the look of models and shoot in motion control," says Moore. "But we were limited to the kinds of shots we could do. There were some moves we just didn't have time to work out using motion control, due to limitations of the model size or camera. With CG that's just not the case. We can throw in hundreds of ships, and we can do moves that we could never do with motion control. Moore continues: "I think we were reluctant to go to CGI, we didn't think it was good. We had tried it, way back in early Next Generation episodes and it just didn't work very well. Occasionally over the years we'd try it here and there just to do something, but it took time for that to grow. I think it took a while for the quality of the CG images to match the originals." Curry adds: "CGI is both a godsend and a drawback - one of the things that is taken away is the kind of alchemy of figuring out how to use materials that were never intended to be used that way - to have the illusion of being something else. Where in the CG world - especially for ships - it's a godsend because it saves us from 60 hours a week of shooting miniatures." Some team members have taken a leap into the world of CG. Rob Bonchune is now supervising VFX animator at Eden, but began working on Trek five years ago as a practical miniature, model and prop maker. He's now left behind the glue and the workshop in favour of Lightwave and a PC. He was thrown in at the deep end when for his first supervisory role on Voyager he was asked to crash the ship onto an ice planet and given two weeks to make it happen. Nowadays, supervised by Suskin, 99 per cent of the time Bonchune's team uses Lightwave to create effects. They've shown that many feats are possible using this simple tool, and that you don't always need expensive software to create the best effects. 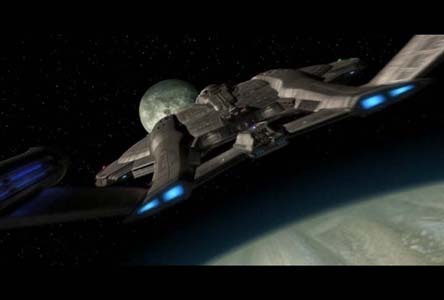 Recently, they've also brought onboard After Effects to speed up rendering, and now use a technique evolved from model filming. "When we're running short on time we render up separate elements, kind of like old school motion control where you're filming space separately and putting everything together," says Bonchune. "The reason we do that is that each separate element will render faster with the stack of machines we have and then if the producers want us to change anything it will be easier and quicker to re-render one element than to re-render the whole shot." Eden also has an unorthodox, yet cost saving method of running a render farm. "With Eden Effects they rent what they need," Bonchune explains. "When I worked at Foundation Imaging the machines were bought and we had roughly 150. Eden's philosophy is more like rent what you need. Therefore as soon as a better chip comes along you get rid of what you have and you get the newest one in. So when we were trying to deliver a show in a ridiculously short amount of time they brought in an extra 40 machines and it made a difference to how quickly we got it done, but on average I'd say there's 50 machines." 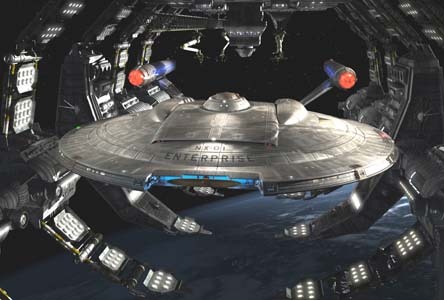 With Enterprise there are no models, not even a visual model for the ship except for a paper version created in order to envision how certain shots might work. "I guess in a sense it is a precedent, Voyager being the last one to use practicals, even though they went away from them in the end," notes Bonchune. "This show is all CGI. We built a CG version of a real ship, with the difference being in the small details. You can sit on the hull on certain parts of the ship. You can keep a camera flying in so you can see writing on small panels on the cargo doors. If it was a filming miniature, you could never do that." Many new alien races have also been brought into the show and their abilities enhanced using CG. Motion capture technology has allowed for convincing physical contortions of the villainous Suliban race, for example. Supervising artist, John Teska said: "We did a cyberscan, so the actual building of the character and the texturing were relatively easy to do the climbing of the walls. It got a lot more complicated for the 'squishing under the door' shots! A lot of that was just manipulation by re-sculpting morph - targets and using the bones and such as reference." Bonchune adds: "What's really amazing to me is the use of motion capture. There's one scene that Teska did where live action Sulibans are walking down a corridor, Teska added two more crawling on the walls. You can't tell the difference! You just couldn't do that four years ago without extreme difficulty, but now we can do it on a much more consistent and regular basis." 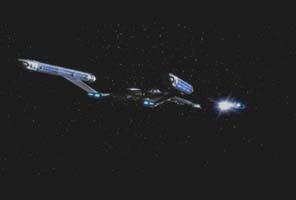 Set extensions are also the mainstay of Enterprise, bridging the gap between the grand illusion of space and the physical sets upon which the actors deliver their lines. There are also other things such as Nebula's etc. This is when they call in the specialists such as NASA and the JPL (Jet Propulsion Laboratory) who provide them with deep space photographs from the Hubble telescope. "We will paint out the stars so we can put in our own stars and shift them around a little bit," says Curry. 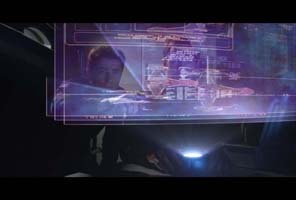 Overall, Enterprise has been a giant leap forward for the post-production team, and also a grand success. Last year the team won an Emmy for special visual effects for its pilot - Broken Bow. The team are also happy with the evolution of effects throughout the show. 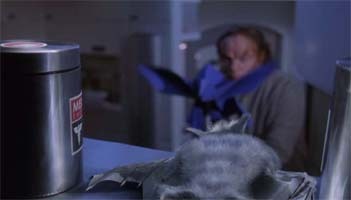 A favourite of Moore's is from a recent episode aired which involved a CG bat flying around the sick bay. "I'm just thrilled, I think it's some of the best CG we've ever done," he says. "It's a very convincing bat, we've even gone in and got close-ups of it - with hair and flickers of the ear!" The guys like a challenge and are happy to take on whatever comes their way. They're used to dealing with tight deadlines, high quality effects and as new challenges appear they feel like they are pushing the envelope further and are given a new level of job satisfaction. "I think that keeps us all going and makes it interesting to work on. We are always coming up with new effects and the writers are constantly providing us with new challenges. That's what keeps it fresh and interesting," notes Curry.